Downtown Paraiso Property offers you comfortable and affordable accommodation on a perfect location. 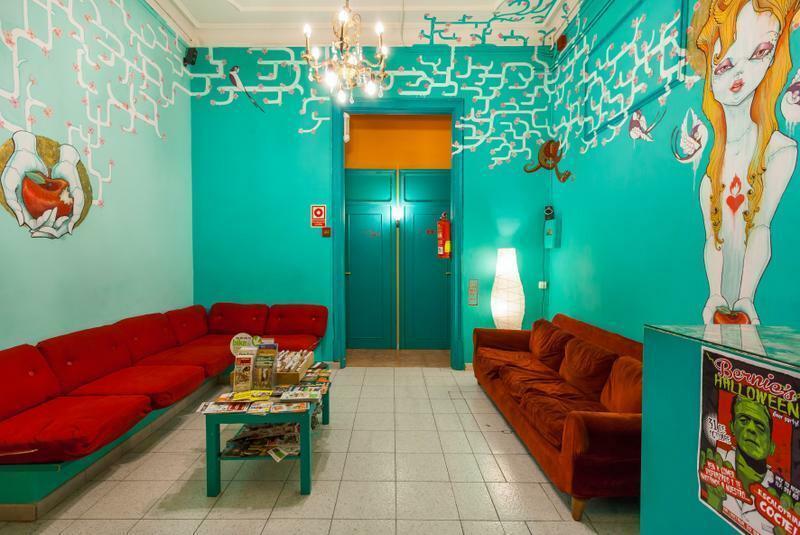 Situated in central Barcelona, 150 meters from the Ramblas, La Boqueria Market and the main tourist attractions, our place is designed for you to have a great time on a warm and friendly atmosphere. The Property has no curfew, no lock out, it's open 24hs. Easy to reach from all Airports, Bus and Train Stations and surrounded by cafes, restaurants, theaters, supermarkets, bakeries, laundromats, post office, and of course nightlife! Our rooms are clean and comfortable all newly decorated, most of them with en-suite facilities They all have lockers where you can leave your things for free (just bring a padlock!) Bed linen, blankets and personal room keys provided. Free High speed Internet access is available as well as free WiFi access for guests with their own laptop. We have a fully equipped kitchen to prepare your own meals and luggage storage for free on the day you're checking out. You can check-in at any time. If you know you are arriving later than midnight, please send us an e-mail with your booking reference number to let us know at what time are you going to arrive. Our staff is on hand to answer your queries 24hs, speaking Spanish, English, Italian, Greek, German and Portuguese. Downtown Paraiso Property is your home away from home and a brilliant place for making friends and enjoy all the sights Barcelona has to offer! We hope to see you soon! Cancellation/modification must be notified by email. The property is located at: Carrer Junta de Comerc, 13 Ppal. Local Train: The station is located at the airport (follow the signs). Take it to Paseo de Gracia and there take the Metro (Green line N3) & get off at Liceu station. Once there take Hospital Street. Walk 2 blocks up, then turn left on Junta de Comercio Street. AEROBUS: The shuttle bus will take you to Plaza Catalunya. It runs every 11 minutes and costs about 5euros (Tickets sale on the bus). From there you can walk about 10 min. to the Property or take the Metro (Green line N3) to Liceu station (one stop). Once there take Hospital Street. Walk 2 blocks up, then turn left on Junta de Comercio Street. METRO: Board Metro (Red line N2) at Arc de Triunf station to Plaza Catalunya (2 stops), then switch to the Green line N3 for 1 more stop and get off at Liceu station. Once there take Hospital Street. Walk 2 blocks up, then turn left on Junta de Comerc Street. Metro: Take Green line N3 & get off at Liceu station. Once there take Hospital Street. Walk 2 blocks up, then turn left on Junta de Comerc Street.